Hatters boss Nathan Jones believes his squad is in an excellent place despite losing 1-0 at West Bromwich Albion in the Carabao Cup last night. The Luton chief made eight changes for the game, with just Matty Pearson, Jack Stacey and Pelly-Ruddock Mpanzu remaining from the side who drew with Sunderland on Saturday. We didn’t just defend it out, first half we controlled the game, we had a real good possession, real good structure about us. Although Baggies manager Darren Moore altered seven of his team that had won 4-3 at Norwich City, he could still call upon players such as Hal-Robson Kanu, Matty Phillips, Ahmed Hegazy, James Morrison and Oliver Burke. The hosts were pushed all the way by Town on the night, with the only goal seeing Burke, a £15m signing from RB Leipzig last season, take advantage of a deflected clearance to race away and beat James Shea. A hugely positive Jones said: “We’ve used the squad, the squad’s in good shape and we’re in a good place moving forward. “We’ve made eight chances, they gave us utmost respect, so we’ve shown we’ve got a wonderful squad here. “I’m very, very proud of them, proud of our recruitment, proud of how we work and we showed some amazing structure in terms of how we played, as we caused them significant problems. “We’ve got young James Justin, a 19-year-old kid, defending against Matty Phillips. I don’t know what price tag Matty Phillips has, but all over the place we were excellent. “Hal Robson-Kanu has got to the semi-final of a European Championship, but Sonny Bradley was magnificent and I think we were as a team. “We didn’t just defend it out, first half we controlled the game, we had a real good possession, real good structure about us. “The only thing was if we had slightly more of a cutting edge, but I’m very proud of how we played. “They showed their Championship quality, but they didn’t carve us open. “They got in and around the box a lot, our keeper made one maybe two saves, but I wouldn’t think there was that much of a gulf. Town weren’t without their chances on the night too, Jake Jervis putting a fine opportunity wide, Harry Cornick dragging across goal, while Pearson sent header over in the second period. On Jervis’ effort Jones said: “That was a wonderful chance, while late on we’ve had a couple of opportunities in and around the box. “Cornick had a one-on-one, but these are good defenders, these are Premier League defenders. “They were in the Premier League three months ago, we’ve just come from League Two, so lets have an element of realism about it. “I can’t be too critical of them, I would love to go and say we should have beaten them, should have done this, should have done that. “We’ve come to the hardest place in round one and I think we’ve been magnificent. “We’ve shown the club in a brilliant light and I’m really proud of them as we’ve shown the structure, the bravery and I couldn’t be more proud of them. “It’s a shame we haven’t got a draw out of it and gone to pens, as I think that would have been fair, but that’s the way it goes. “It’s not like we had them at our place, they were in their home comforts and we matched them. “I’m so pleased with that, as Championship sides will come here and get turned over far worse than that. Jones was quick to hail Pelly-Ruddock Mpanzu who had another excellent display and is showing without doubt his best, most consistent form, for the Hatters so far this term. 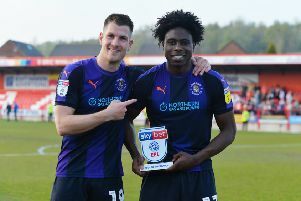 The Luton boss added: “He finished the season well and has gone through pre-season that way, so it’s a work in progress, they’re all work in progresses. “We develop players here, see the players we’ve got, young James Justin, his second game, the back four defended superbly well, Sonny Bradley for his full debut was outstanding, and then through the midfield. “Last year we were playing League Two football and they were playing Premier League football.